A few weeks ago my mom gifted me with some canned flaky biscuits. Now, I rarely buy canned biscuits because I have a habit of eating the entire can at once. One fresh out of the oven. A few more with dinner and suddenly they’re gone. So, yeah, no biscuits for me. But here I was with a can of biscuits. Two, in fact, and I needed something to make with these pure, delicious carbs. A quick Pinterest search and victory: Biscuit Egg Casserole. My first take was to make this casserole as is. 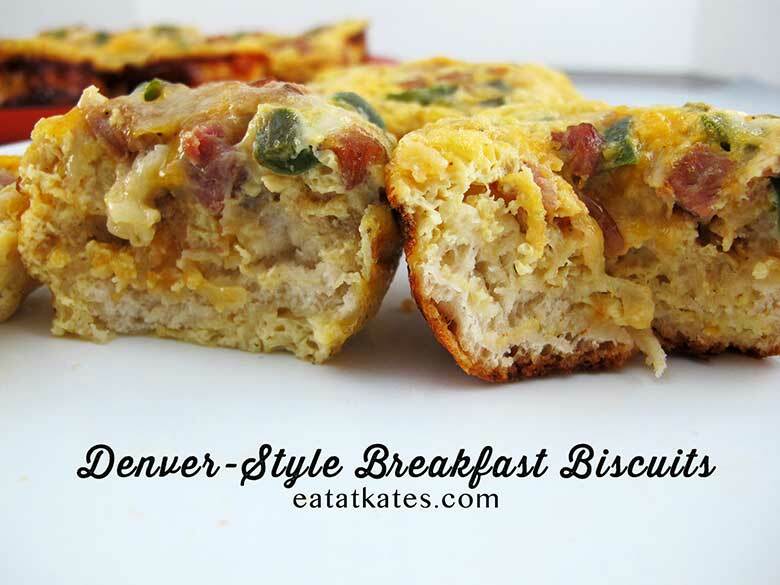 It was quite delicious and a simple breakfast that can serve a crowed or be reheated for a quick weekday breakfast. But, it wasn’t quite what I was looking for. I wanted a little more “oomph”. Like onion and pepper and little more crisp on the biscuit. That’s when it hit me: individual servings. 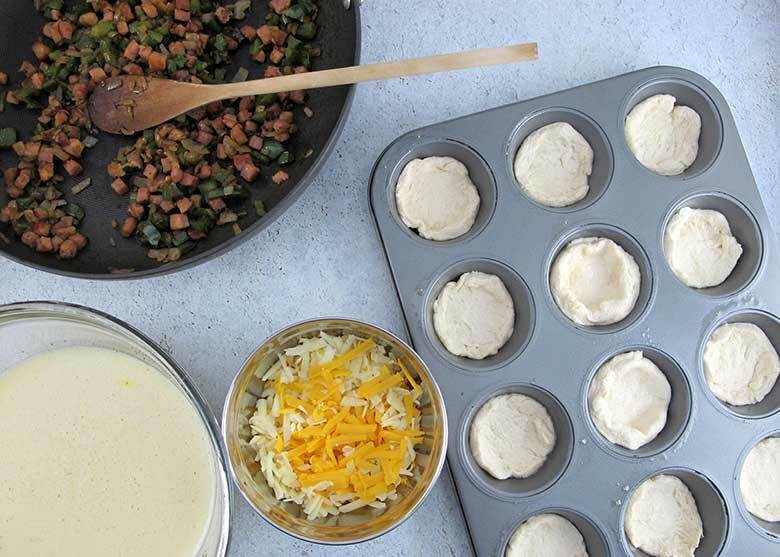 Not only would they get an extra hit of crust because of the muffin pan, they’d still be good for a crowd, and an easy take-and-go breakfast or snack. First you give the eggs and milk a quick “zhoosh” in the blender (no weird, chewy egg white!). Then you saute the onion, green pepper, & ham together, let cool and then stir into the eggs along with shredded cheese. Then, open the can of biscuits. It depends on how you feel about whoever is in the room. I personally love that little pop it makes, though I’m certain some day they’ll be sued for giving someone a coronary. Split each biscuit in half (this is why you need the flaky ones). They do not have to be perfect halves, just find a decent spot where you can pull them apart. Give each half a quick smoosh to stretch it out and place it in one of the wells, tucking it in to the corners and up the sides. Once the biscuits are in the pan, spoon the egg mixture on top. 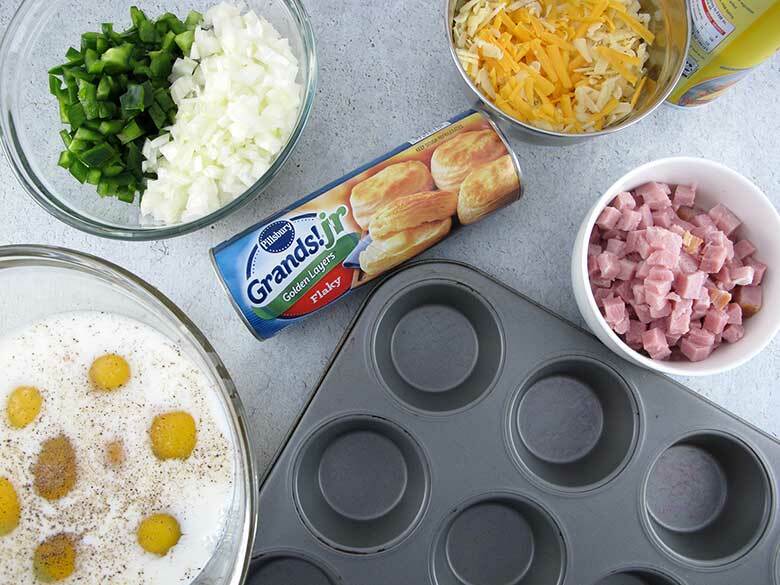 Don’t put too much egg mixture in [like my middle row here], otherwise they’ll overflow while they bake. I’d suggest putting a sheet pan underneath these while baking to avoid any cooked-on egg on the bottom of your oven. On Left: Biscuit in the middle. On Right: Biscuit on the bottom. On both? Delicious. Bake at 425 for 15-18 minutes; until the egg is set. You can make the egg mixture (eggs through cheese) the night before you bake and keep, tightly covered, in the refrigerator. I don’t recommend prepping the entire biscuit until you’re ready to bake. Biscuits keep in the refrigerator for about three days. For longer storage, pack into containers or bags with as little air as possible and freeze for up to two weeks. To reheat, from thawed, microwave for 30-45 seconds. Yup, that’s it. You can also use the larger flaky biscuits OR you can use whole small biscuits (not split), but you’ll have to reduce the amount of egg mixture used in each biscuit. Which combo would you try or make up? Let me know in the comments! 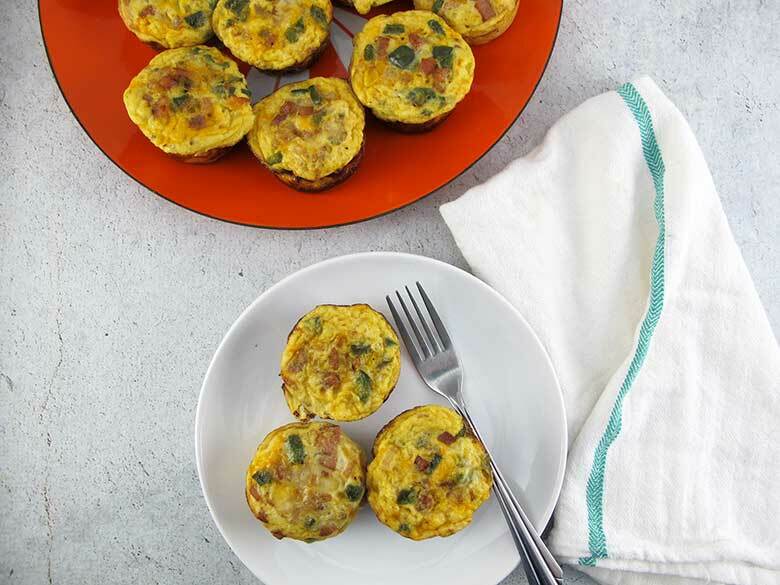 A simple make-and-take breakfast perfect for crowds or busy weeks. In blender, mix together eggs and milk. Season with salt and pepper, pour into large mixing bowl, and set aside. In medium saute pan, cook green pepper & onion until soft. Add ham and cook until well browned. Add ham & veggie mixture to eggs and stir well. 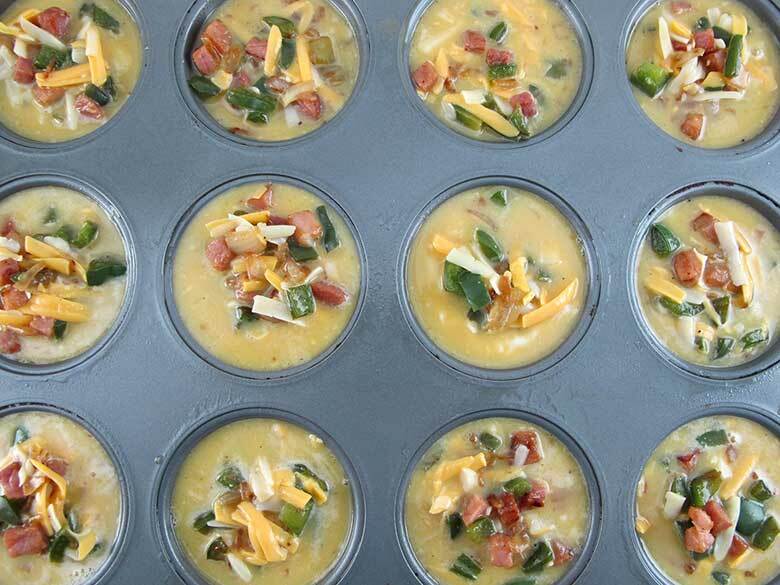 Mix in cheese & set aside. Line 20 wells with split biscuits halves. 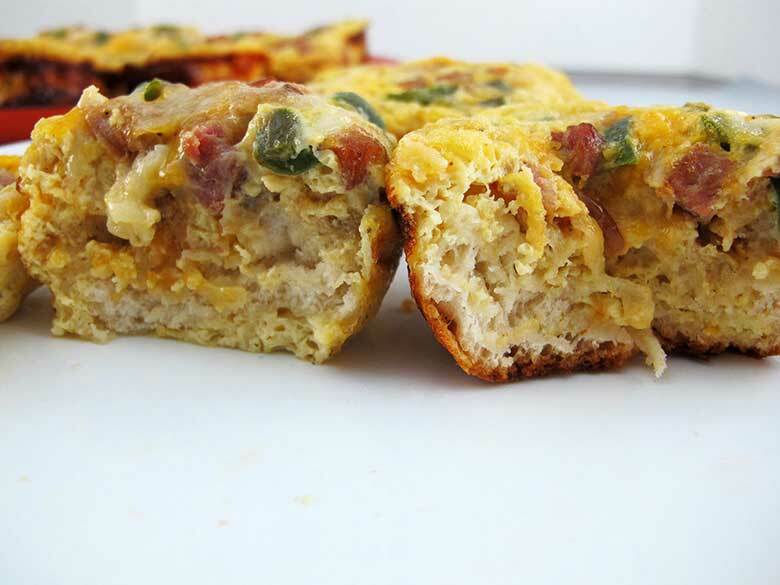 Portion veggie, ham, & egg mixture on top of muffins. Egg mixture can be made ahead and kept, covered in the refrigerator, for one day. Baked biscuits keep for about three days in refrigerator and 1-2 weeks in freezer. Yum! This is such a great idea! I love it. Thanks, Melissa! I really love how versatile these are. Pretty much “anything goes” with these!